Style and ambience is effortlessly added to any room with this top-quality freestanding wine cooler by Danby. It features an all-black cabinet with stainless steel trim and elegant Beechwood shelves. The unit can easily be programmed and monitored with the high-tech digital LED thermostat which can be viewed through the tempered glass door. This diverse appliance features two separate temperature zones for red and white wines and can comfortably store up to 38 of your favorite bottles. The top compartment can be programmed between 5°C and 10°C (41°F and 50°F) while the bottom section has a temperature range of 10°C to 18°C (50°F to 64°F). The cool blue interior lighting system provides a subtle atmosphere by illuminating your collection without adding heat to it and the new stainless-steel towel-bar door handle adds a stylish touch. This striking cooler offers a convenient frost-free operating system as well as an intelligent reversible door swing for left or right hand opening. In addition, it comes with a smooth back design which allows you to install it flush against a wall. 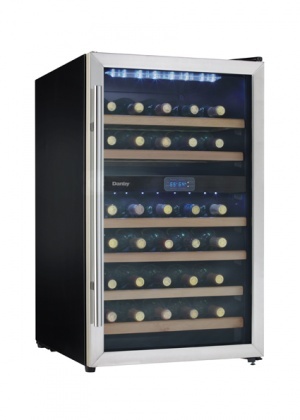 To top things off, this superior wine cooler also has a 12-month warranty with in-home service.